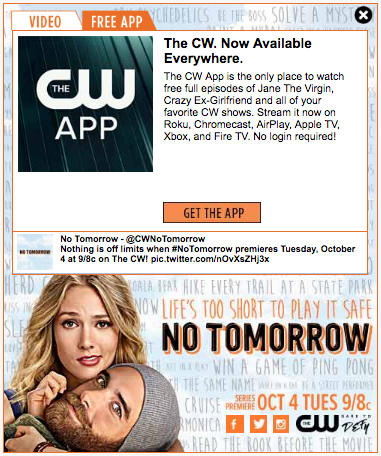 Tune into The CW Tuesdays 9/8c to watch No Tomorrow. 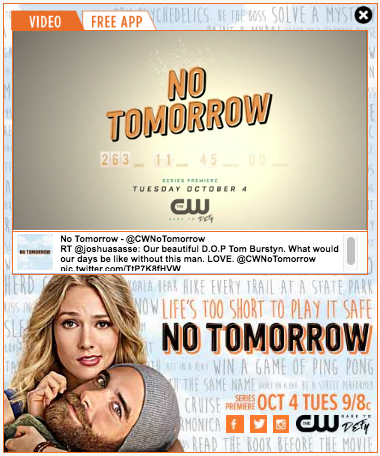 The Illusion Factory worked closely with the creative and management teams at The CW Television Network, Sizmek and OMD to promote the launch of No Tomorrow in the electronic media landscape using interactive HTML 5 based rich media and mobile advertising platforms. 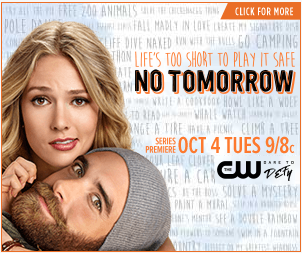 No Tomorrow is an upcoming romantic fantasy comedy-drama series. The series is based on the Brazilian series Como Aproveitar o Fim do Mundo (How to Enjoy the End of the World), which aired on TV Globo in 2012. No Tomorrow was created by Scott McCabe, Tory Stanton, Corrine Brinkerhoff and Tori Anderson and Executive Produced by Corinne Brinkerhoff, Maggie Friedman, Ben Silverman, Brad Silberling, Scott McCabe, Sean Canino and Tory Stanton. No Tomorrow stars Tori Anderson, Joshua Sasse, Amy Pietz, Jesse Rath, and Sarayu Blue.